Fortnite Battle Royale gets a new weapon today, the heavy shotgun. 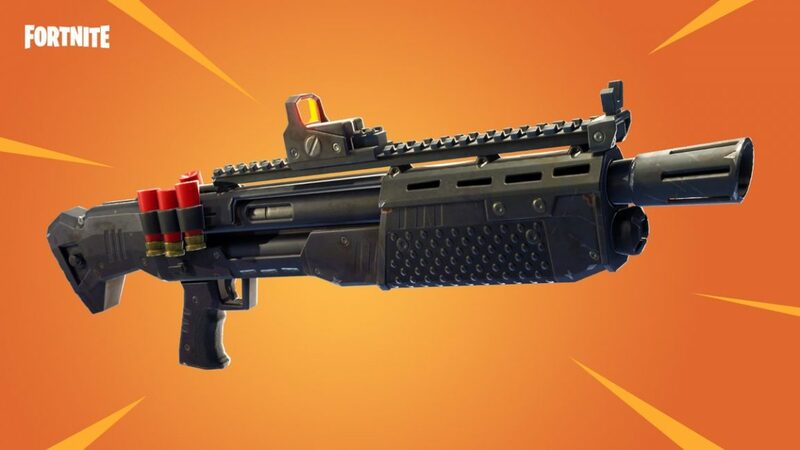 Following hot on the heels of last week’s remote explosives, the heavy shotgun arrives at midday GMT and there will be no downtime. How is the heavy shotgun different to the other shotguns, I hear you ask? It has increased range. Boom. Fornite has been adding and removing weapons at an almost weekly rate as it balances the Battle Royale meta game. Sticky bombs and the heavy shotgun are the newest weapons, but it has also removed smoke grenades and the SMG in recent months. Epic says these weapons are placed in “the vault” and may return at a later date. Other recent additions to the arsenal include the hunting rifle, the hand cannon and the crossbow with unlimited ammo. Fortnite’s week 5 challenges have also gone live today, adding another 7 tasks that will hand out extra battle stars and XP. All remaining week challenges stay live until the end of Season 3, so there’s still plenty of time to find all the forbidden dance locations, visit the ice cream trucks and follow the Snobby Shores treasure map. Yesterday developer Epic Games revealed a replay editor for Fortnite, something that fans have been requesting for a long time.